Pistachios are the second green souvenir on my list. A scoop of pistachio gelato sharing space in a piccolo (small) bowl with a scoop of fragola (strawberry) gelato is a taste treat with a pleasing color combination. 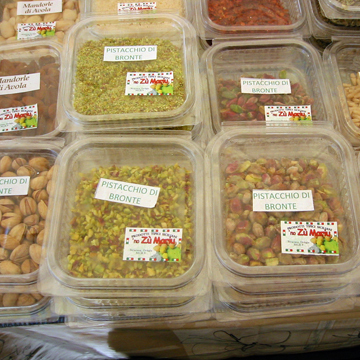 In Sicily, pistachios are sold in or out of shells, as a sweet paste that makes a breakfast treat when spread on bread with jam or ground to a fine dust to sprinkle on grilled fish. I’ve been enjoying crackers spread with a mixture of ground pistachios and soft butter as afternoon snack. I don’t know where to put pistachios. There are salted pistachios in many grocery stores that can be shelled and ground but recreating the sweet spread would not be satisfying, and authentic gelato is hard to find. Nuts! According to the label, the sweet pistachio spread has sugar, emulsifiers, and milk of some sort. I have to do some more research to see if there is a more traditional recipe somewhere. I’ll have to wait until I get back to Vermont to try using a bit of sweetened condensed milk with ground pistachios. To be continued…….. I am intrigued with the pistachio jam, the sweet paste you speak of… perhaps you can enlighten this simple mind with a rundown… is it as simple as ground nuts and jam?